Axxess Identification has over 20 years’ experience in the development and manufacture of complete access and security solutions. Mojo Barriers was established 25 years ago and provides crowd control and barrier products worldwide. Hodgson Sayers is a specialist in the design and manufacture of security doors, steel enclosures and acoustic enclosures - and will be launching a new range of products at IFSEC. WEC CCTV is a world class manufacturer of CCTV Poles, Lattice Towers, Columns, Highway Structures, wall mounted camera poles, Cantilever poles, and associated CCTV brackets and accessories. CI-200 is an innovative service box to provide protection for the devices, such as PoE Switch,Media Converter, and Power Supply. With tempered lock design, cooling systems, and U bracket design for pole straps for wider projects’ application. CI-701W is IP68 weatherproof with wiper housing controlled by camera’s DI/DO with intelligent technology for wiper protection on facing obstruction and power failure. 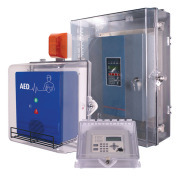 The range of polycarbonate cabinets offer excellent protection for a wide range of equipment such as control panels, keypads, AEDs and other important devices. Join Heber Ltd, designers and manufacturers of electronic control systems, in Hall 5, Stand J126 at IFSEC for the chance to win a Raspberry Pi computer.